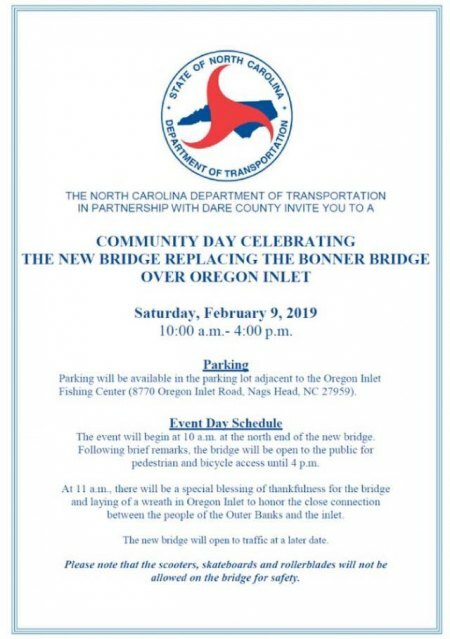 The N.C. Department of Transportation and local officials have planned an informal community day of Feb. 9, 2019, to celebrate the new bridge to replace the 55-year-old Bonner Bridge. When: Saturday, Feb. 9, 2019, 10 a.m. to 4 p.m. Parking will be available in the lot adjacent to the Oregon Inlet Fishing Center, 8770 Oregon Inlet Road, Nags Head, NC 27959. The event will begin at 10 a.m. at the north end of the new bridge. Following brief remarks, the bridge will be open to the public for pedestrian and bicycle access until 4 p.m.
At 11 a.m., there will be a special blessing of thankfulness for the bridge and laying of a wreath in Oregon Inlet to honor the close connection between the people of the Outer Banks and the inlet. The new bridge will open to traffic at a later date. Please note that scooters, skateboards, and rollerblades will not be allowed on the bridge for safety.